Before submitting your burning permit, check weather conditions; keep fires small; keep a hose close; and never leave attended. Weather conditions are drier than they appear and can quickly grow out of control. 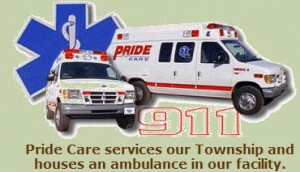 Can first responders find you? Scam Alert! Scammers are calling and requesting funds on behalf of your local fire department association! Don't fall victim! 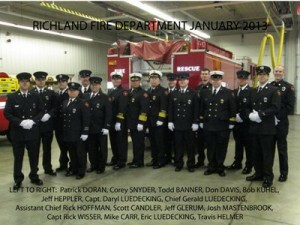 Richland Firefighters Association will never call and request funds. All fundraising is done through the annual flower sale and pancake breakfast. If you have any questions you may contact the township office at 269-629-4921. Stay safe! Stay informed! 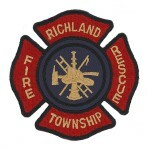 To Honorably serve the Residents of Richland Township by delivering service, with respect, responsibility, and pride. 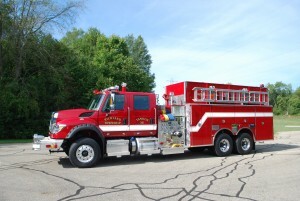 The picture above is the Fire Tanker purchased in 2017. For non-emergency questions and information the Fire Department can be contacted via the phone at 269-629-4921 or via an email at Contact Us.